Sometimes people ask me, ‘Why do we see so few genuine miracles in our day?’ It is not that God is no longer capable of working miracles, yet we seem to experience so few of them. There are plenty of hyped pseudo signs and wonders on display, but few genuine spiritual manifestations. Is this your experience? A similar question which engages me, concerns why our times of prayer, both private and corporate, are often such uninspiring events. A third question I ask myself is, why do we take Jesus at his word when it comes to things like love for one another, but not when he speaks of us moving mountains with words of faith? It seems to me that the normal experiences of modern disciples of Jesus Christ are very different from those of the first disciples. Does God not intend the things of today to be at least as they were in the first century? Am I foolish to think that the spiritual power of the church of Acts should be a minimum standard for the church of today? I just cannot believe that God wants us to be passionless and powerless Christians. If Jesus is the same Lord today as he was two thousand years ago, then he just cannot be happy with our largely lukewarm approach to Christian life. What do you think? Do you regard today’s Christianity as generally passionless and powerless? If so, do you include yourself in this diagnosis? The typical churched believer will die without leading a single person to a lifesaving knowledge of, and relationship with, Jesus Christ. When asked what constitutes success in life, few believers define success in spiritual terms. When given the opportunity to state how they want to be known by others, fewer than one out of ten believers mentioned descriptions which reflect their relationship with God. Churched Christians give away an average of about 3% of their income in a typical year, and feel pleased at their ‘sacrificial’ generosity. In a typical week, only one out of every four believers will allocate some time to serving other people. The likelihood of a married couple who are born-again churchgoers getting divorced is the same as couples who are not disciples of Jesus. Eight out of every ten believers do not feel they have entered into the presence of God, or experienced a connection with him, during the Sunday worship service. So, based on statistics such as these, and on my own observations, I would say that most Christians are far from passionate and spiritually powerful. Why is this? Could it be that the pressures and pace of life have something to do with it? Jesus told the parable of the soils, in which he described how the thorns of worry and the deceit of wealth choked the plants (Matthew 13). Perhaps another reason is that we just do not believe all that we profess. Contributing factors seem to be that we tend to confuse volume and energy for spiritual vitality, and psychology and emotionalism for evidence of spiritual impact. What do you think? Some attribute the current lack of genuine spiritual manifestations, not to a lack of passion or belief, but to a cessation of spiritual ‘gifts’ in our day. I don’t believe that we can be true to scripture and at the same time hold this position. Perhaps part of the reason is because we have become confused concerning the nature of prayer, the stewardship of spiritual power, and the need to proclaim in word and ministry. In this sense, we have disconnected prayer from power, and power from proclamation. One of my objectives in writing this series is to explore a way of rejuvenating our spiritual lives, both individually and in our churches. In an attempt to address this, I bring into dynamic unity the three spiritual elements of prayer, power, and proclamation. Passion originates with prayer, but ignites and explodes as we receive power and then boldly proclaim God’s will. We need to speak and act differently, but to do this we first need to think differently. Underlying our apparent lack of passion and power is an inadequate theology. Modern man just loves to reduce complexity and subtlety to simple formulas and mental ‘boxes’. We appear to have done just that with our theology of prayer and ministry. Either we have attempted to make prayer into something it is not, or we have separated it from the other elements of spiritual life and ministry – power and proclamation. In this series, I seek to integrate these three elements and to restore them to a ‘whole’. I am not going to base my reasoning on esoteric philosophy, nor am I going to use quantum physics as a foundation for the doctrines I propose. However, I do intend to draw supportive evidence and illustrations from both. My source of authority is the Word of God, but I need to explain what I understand as the ‘Word of God’. The Lord Jesus Christ is THE Word of God. He is the source of all truth. In himself, and in what he said and did whilst on Earth, he is the Word of God. The Bible is the divinely inspired and formed documentary record of The Word. As an Evangelical Christian, I am accustomed to viewing the Bible through ‘Jesus spectacles’. In this way, I see the Bible as the source of truth, and Jesus’ life and words as lenses through which I observe and interpret scriptural truth. I want to add another perspective. You see, Jesus himself is the object, the source of truth, and we view him through the lens of scripture. Difficult as it may be to envisage, both analogies apply. We cannot understand scripture other than through a Christocentric lens. However, in order to apprehend truth we must see beyond the text to the source, and Jesus is the source. We look through the lens of scripture to appreciate Jesus, yet we have to put on a Christ-centred pair of spectacles in order to comprehend what the scriptures truly reveal. The clearest picture analogy I can think of is that of a person wearing spectacles and looking through a magnifying glass at a picture of Jesus. The spectacles represent a Christ-centred understanding of the Bible. The magnifying glass represents the Scriptures. Over the next months, I will be reproducing edited parts of my book Prayer, Power and Proclamation on this blog, please interact with me in the comment section below and if you feel that the content has brought value to your understanding of Jesus and scripture, share it with others. Thank you so much for this very interesting post. 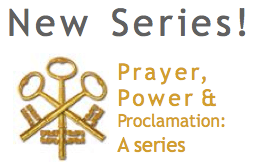 I am looking forward to reading through this series of ‘Prayer, Power and Proclamation’. It is so sad that we as individuals and local churches are so passionless and powerless today. I keep thinking to myself that there must be more to the way that I have been ‘experiencing church’. Could part of the problem be that we have lost sight of ‘the priesthood of all believers’? The New Testament pictures an ‘every member ministry’, yet in many (if not most) churches today a select few, e.g. the pastor and sermon takes centre stage. When a pastor has centre stage the congregation sits passively. They have no opportunity to actually ‘do theology’ or to minister in areas where God has gifted them. Small groups or cell groups do offer a better opportunity for Christians to minister, how different could things be if our church ‘services’ are transformed in such a way that everyone present can minister and be ministered to. These are just some of the things that have been on my mind lately. Oh by the way, are your books only available in hard copy or are they also available in PDF or another electronic form? @ Sean Thank you for your comments. Yes, I think that one-man-bands tend to quench the move of the Holy Spirit in a church over the longer term, although God often uses one person to ignite His people in a particular place and time. Also, my comments concerning the church are of necessity generalizations and I am sure there are many churches, of differing leadership and ministry structures, that are both passionate and prayerful.